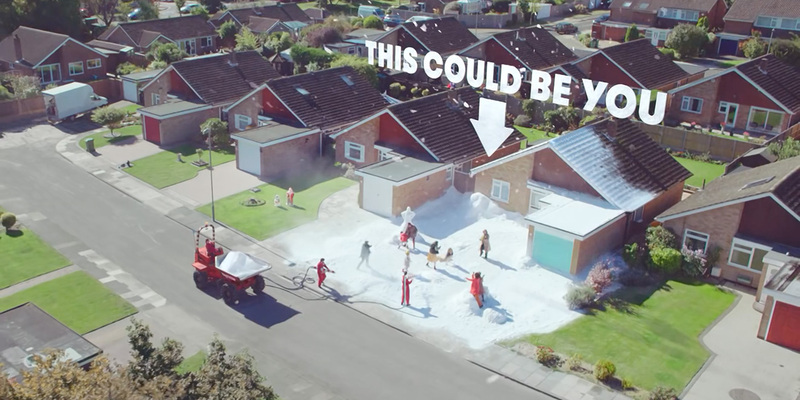 Global warming must be getting really bad this year, because European retailer TK Maxx is offering customers a chance to have fake snow delivered to their house on Christmas Day, for free. The discount department store and Wieden + Kennedy London are launching a new “White Christmas” campaign, hiding special two-foot snow globes in department stores across the U.K., Ireland, Germany and Poland, as well as online. Shoppers can find them starting this Friday (Nov. 17), and if they do, arrange to have TK Maxx send a crew to douse their home (or another location of their choosing) in snow. A 60-second ad voiced by the unmistakable Bill Nighy promotes the stunt, featuring a family around the Christmas tree opening the presents that archetypical hot-dog-sniffing Grandpa has picked up at TK Maxx. Among them is one of the lucky snow globes, which he’s given to his granddaughter (an event that even warrants him looking up from his fire-roasted tube steak to smile at her). Upon ripping it open, she runs to the door, and opens it, only to be happily buried in a mini avalanche. Outside, TK Maxx’s incredibly chic team is on hand with candy-cane snow bazookas and a dump truck full of the stuff, enough to make the whole family happy. Overhead, an artiste even sprinkles one last pinch of snowflakes on the suburban front yard from a rope ladder hanging off a helicopter—to ensure the experience is truly magical. In reality, the marketer will work with Snow Business, which provides artificial snow for the film industry, to deliver on its promise. A digital game, accessible via web or smartphone, will let users shake a virtual snow globe for shopping inspiration, and a chance to win gift cards to the store, or one of the “White Christmas” snow globes (and accompanying frost). Climate jokes aside, White Christmases are relatively rare in the U.K. The precise criteria get surprisingly complicated, but suffice it to say they occur somewhere in the country on average every six years, with the last one, in 2010, being unusually widespread. (Snowfall is more likely to occur in later winter months, between January and March). Overall, it’s a sweet idea, which W+K will bring to life with help from three other shops—Mindshare, Ogilvy PR and Energy. A second ad, due Dec. 13, will feature one of the promised “White Christmas” experiences. Would-be winners shouldn’t worry that they might get gipped, though, if nature does deign to blanket their home in powder on Christmas, Walker suggests. “If it does snow, we’ve got a little something up our sleeves too,” she says.